The Home Builders & Remodelers of Mohawk Valley invite you to our 25th Annual Home Show. Whether you’re an industry professional who wants to put your best foot forward and display your products and services or a homeowner looking for ideas for your next remodel, the Home Show truly has something for everyone. As the Mohawk Valley’s premier home building and remodeling event, you won’t want to miss your chance to participate in Home Show 2019! You’re invited! Meet professional builders and remodelers and get great ideas for your next project. Become an exhibitor! Mix and mingle with other industry pros – and thousands of potential clients! You’re invited to attend the HBRMV Home Show 2019! The Home Show has been a local highlight each spring since 1994, and is one of the largest shows in central New York, typically showcasing more than 140 homebuilders and remodelers. Last year, more than 3,000 people attended the Home Show. If you were among them, you know what a great time it is. If you weren’t, come see what you’re missing! Thanks for your interest in becoming an exhibitor at the HBRMV Home Show 2019! By registering as a vendor at the Home Show, your business will be showcased at one of the largest home shows in Central New York, and you will have access to thousands of attendees. Last year, more than 3,000 people attended the Home Show. If you exhibited last year, you know it’s a great opportunity to interact with potential customers. If you didn’t, there’s no better time than the present to sign up! The Home Builders & Remodelers Association of Mohawk Valley is a non-profit organization representing the residential construction community throughout the Mohawk Valley Region. The association advocates choice in housing, economic growth, and quality of life in our region. Our builder members include small, medium and large volume home builders, commercial builders, developers and remodelers. The Home Show has been a local highlight each spring since 1994. It is one of the largest shows in central New York and typically showcases more than 140 home builders and remodelers. The event will feature displays exhibiting new products and services for local homeowners. Exhibits include the latest in new technologies from home builders and developers, remodeling and home improvement contractors and building material suppliers. Additionally, companies such as HVAC, landscaping, pools and spas, appliances and lending institutions will also be represented at the Home Show. 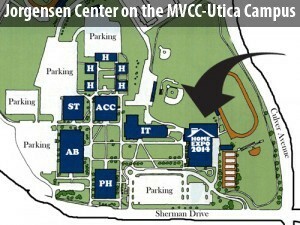 The Mohawk Valley Home Show will take place from Friday, March 8 until Sunday, March 10 in the Jorgensen Athletic Center on the MVCC-Utica Campus. The event is open to the public.